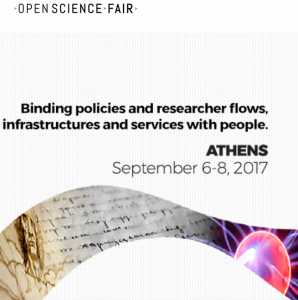 On September 6-8, a lively delegation of researchers, enterprises and policy makers from all over the world met in Athens for the Open Science Fair, the inaugural international conference on Open Science and the first of its kind in Europe. With its powerful slogan of “binding policies and researchers flow, infrastructures and services with people”, the event took place in the new premises of the National Library of Greece (NLG) at the stunning Stavros Niarchos Foundation Cultural Centre. Organised by the consortia of four large EU-funded projects, namely OpenAIRE, OpenUP, FOSTER and OpenMinTeD, it was locally curated by the National Kapodestrian University of Athens and the “Athena” Research and Innovation Center (ARC) and co-sponsored by the National Library of Greece. OSFair2017 successfully reached its expected outcomes by bringing together distinguished speakers and enthusiastic discussants with various expertise, from sciences to economics and politics, all engaged in inspiring keynotes, exciting debates on the implementation of OS principles, useful training sessions and an interesting poster showcase. Keynote speakers included Prof. Nectarios Tavernarakis, from the Foundation for Research and Technology-Hellas, who also presented the latest initiatives of the European Research Council (ERC) for Open Access and data integrity; Prof. Jeffrey Sachs, Director of The Earth Institute at Columbia University and senior UN advisor, with a brilliant opening speech on the link between OS and sustainable development closed the first session of the conference; and Prof. John P. A. Ioannidis from Stanford University, who closed the conference with a portrait on reproducibility of science. The key subject of openness was explored in all its dimensions, from pure research and academic analysis to structured policy and innovative business applications. A manifold range of topics were discussed, including new publishing models complying with OA policies; open peer review and dissemination of research; development of OA platforms and fostering of text and data mining. The Opening on Wednesday the 6th welcomed participants with the introductory speeches by Yannis Ioannidis, President of ARC, Fillipos Tsimpoglou, Director of NLG, followed by a fruitful discussion on the Greek Open Science Agenda initiated by the Greek Minister of Education Kostas Gavroglou and concluded by Natalia Manola from ARC and on behalf of the three organising EU projects. The second day of the conference opened with an assorted range of speeches, all under the theme “Open for all? Diversity and disparity in Open Science”, including a gender perspective on “The role of women in exploring, understanding and archiving the past” by Maria Georgopoulou, Director of The Gennadius Library American School of Classical Studies at Athens; the inspiring “Open Science: A Global South Perspective” by Ahmed Oluwagbemi Ogunlaja, from Open Access Nigeria, and the critical “Barriers to Open Science for junior researchers” by Jon Tennant, from Communications Director ScienceOpen. They were all followed by a questions and answers session and a final fruitful discussion with the audience. The Conference also featured a number of interesting workshops related to OS, which tended to focus on the actual implementation of OS and OA within the whole research lifecycle. One of these being “TDM: unlocking a goldmine of information”, organised by OpenMinTeD, with the participation of Natalia Manola and Stelios Piperidis from ARC, Martine Oudenhoven from LIBER and Thomas Margoni from CREATe. The three-hour workshop focused on Text and Data Mining (TDM) as “a natural ‘next step’ in open science”, which fosters innovation and augments research impact. The workshop, articulated in two parts, showed a number of interesting and successful examples of TDM applications, which illustrate in details the value of TDM in finding patterns and connections that may lead to new discoveries. The workshop concluded with a clear illustration by Thomas Margoni (Open Science checklist for repositories and publishers) of the legal issues surrounding TDM, emphasising the current legal barriers but yet providing some key recommendations for publishers and repositories to open up content for TDM purposes. OSFair2017 was not only about pure research. An interesting workshop that explained the often undervalued link between research and business was “EOSC meets enterprises’ needs!”, organised by Chryssa Stavrakaki and Jorge Sanche from ARC and the European Open Science Cloud (EOSC) pilot project. The discussant engaged in a lively discussion on what is the position of the industry towards the EOSCpilot and depicted the potentiality of such project not only for research but also for businesses, following up with the outcomes of a separated workshop run by EOSC, which attempted to clarify what are the benefits of sharing and reuse of scientific resources and data within the Open Science framework. Among the training sessions, of particular interest was the “OpenMinTeD Platform Training: Discover the power of TDM”, organised by OpenMinTeD and run by Androniki Pavlidou from ARC. During this session, the beta version of the OpenMinTeD platform was shown, with a detailed illustration of its functions and settings. At the end of the session, participants knew how corpora and TDM tools practically run on applications and learn the basis to use the services offered by the Platform, such as access or upload content and tools; find a run applications; structure, index and search content, analyse and annotate accessible resources; identify connections and patterns; input a further mining cycle. In addition to keynote speeches, workshops and training sessions, OSFAIR2017 gave also the opportunity to present posters that were on display during the Conference. One last final mention deserves the Open Science Cafe, co-organised by LIBER, OpenMinTeD, FOSTER Plus, EU-DAT, FutureTDM, EOSC and OpenAIRE, which had the additional value of discussing fundamental aspects of OA and OS in an informal but engaging setting: participants were asked to pick up playing cards from their round tables and reply to the questions, or comment on the statements, displayed in each card. The Cafe was a singular and effective way of thinking about the serious topics of openness in a more relaxed and friendly environment. Presentations and videos from the event are available here.